If like me, tacos are a frequent meal in your dinner rotation, you might be looking for a way to change things up a bit. I've got the perfect recipe for you. How about a taco casserole? Doesn't it look yummy? It's got all the traditional taco fillings - ground beef, beans, and lots of melted cheese! I like to load up my tacos with lots of veggies too. Feel free to add your favorite taco toppings like tomatoes, salsa, or tomatillo sauce. Your family will love this new take on traditional tacos and you'll love how easy this recipe is to make. Enjoy! 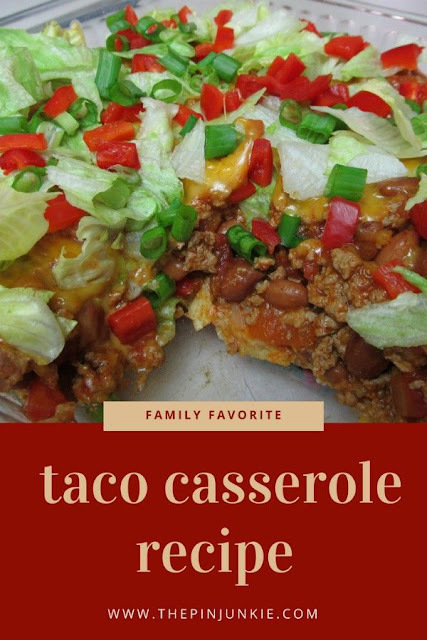 A different way to serve traditional tacos, this taco casserole is sure to be a family favorite! Cook ground turkey in skillet until browned. Drain. Add taco seasoning packet and water. Cook about 5 minutes or until sauce is thickened. Add diced tomatoes. Bring to a boil. Reduce heat. Cover and simmer about 10 minutes stirring occasionally. Add pinto beans. Cook uncovered another 5 - 10 minutes or until liquid from tomatoes is reduced. In an ungreased 2-quart casserole dish, place broken tortilla chips or taco shells. Top with beef mixture. Sprinkle with cheese. Microwave about 3 minutes to melt cheese. Top with lettuce, green onions, and red bell pepper. Serve warm. Find more tasty southwestern recipes in the recipe index! This project was inspired by pins from my Recipe board. This site includes links to sponsors or affiliates, which give me a small percentage of the sale. You are not obligated to use these links when you make a purchase, but when you do so it helps to support this site. Thank you! Oh my yumminess!!!!! Pinning this for sure, and probably making it this weekend. My kind of recipe. Looks delicious! The only change I would make is substitute tomatoes instead of red bell pepper. Going to try this today! Thanks! The recipe said to use corn tortillas, but I didn't have any so I used the taco shells as a substitute. Anything to avoid an extra trip to the grocery store! my family will love this pinning it. great idea to use turkey insted of beef much lower in fat. Thanks for sharing it on foodie friday. Fat is actually GOOD for you!! Paleo/Primal is the way to go. 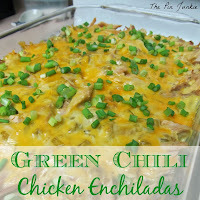 The ONLY thing I would change with this recipe is to omit the chips/shells! But red meat is not, variety&moderation . Not all fat is good for you it depends on the person&their health! This is so inspiring. This will be dinner today! So delicious. This looks so yummy! I pinned it so I can give it a try! I popped over from Monday Funday--thanks for sharing! Your picture caught my eye and made me want to visit from Sundae Scoop Link Party. This looks and sounds like a great weeknight meal that my family would love. Thanks for stopping by Kari! I love any type of Mexican food! This looks fabulous. Pinned! Thanks for sharing your delicious Taco Casserole, we will just love it. We eat tacos a lot at our house too! I love this change-up! 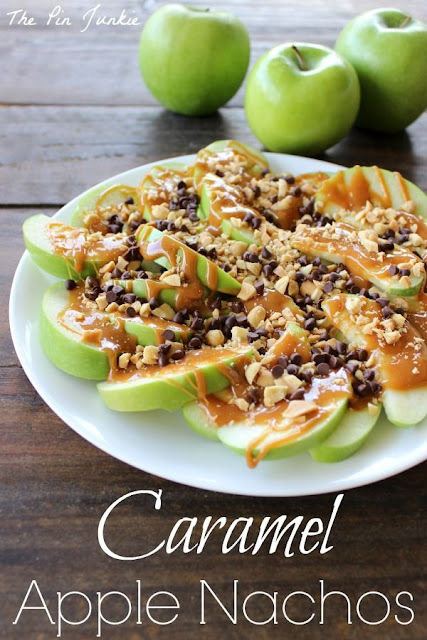 Thanks for sharing this, pinning to try soon! Hope you're having a great week! This sounds really good! My family would love it! Thanks for the invitation Shawna! Pinning to my Dinner board. Yummy yummy! We LOVE tacos at my house! I pinned so I can make it later! Thanks for linking up to Manic Monday! Thanks for linking it up to Super Sunday! Hope you can come back next week! This looks really good. 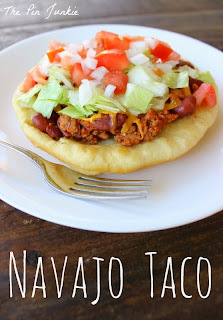 Next week instead of just having regular tacos I'll try this for taco night! I hope your like it as much as I did! I know you can't see it, but I am seriously drooling... 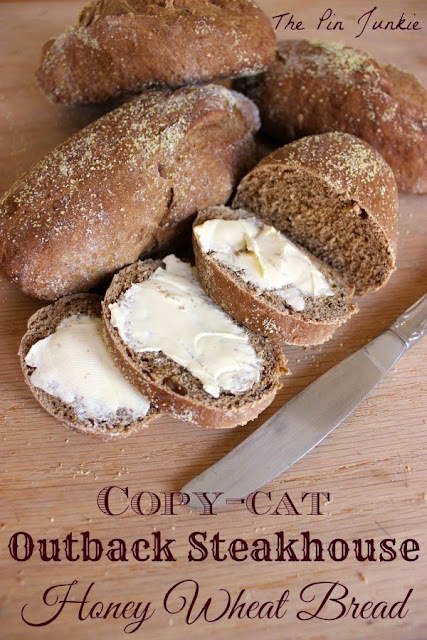 I am making this tomorrow night! 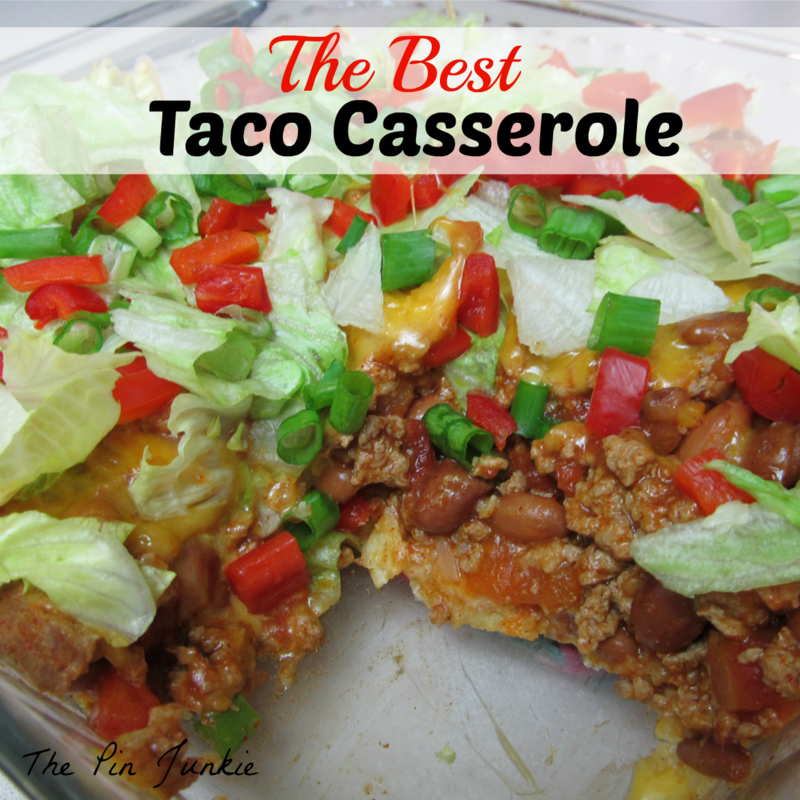 Homemade tacos are the best, but taco casserole may be even better! 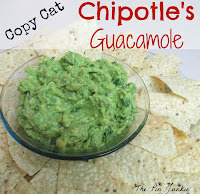 I always have extra tortilla chips so this would be great and easier for the kids to eat too. I'm a new follower & I found you via the Create It Thursday Link Up! Hope you have a fantastic week, & feel free to stop by my blog & say hello! Thanks for stopping by Krys! Jalapenos would be a great addition! We love dinners like this - easy to put together and the family always loves it! 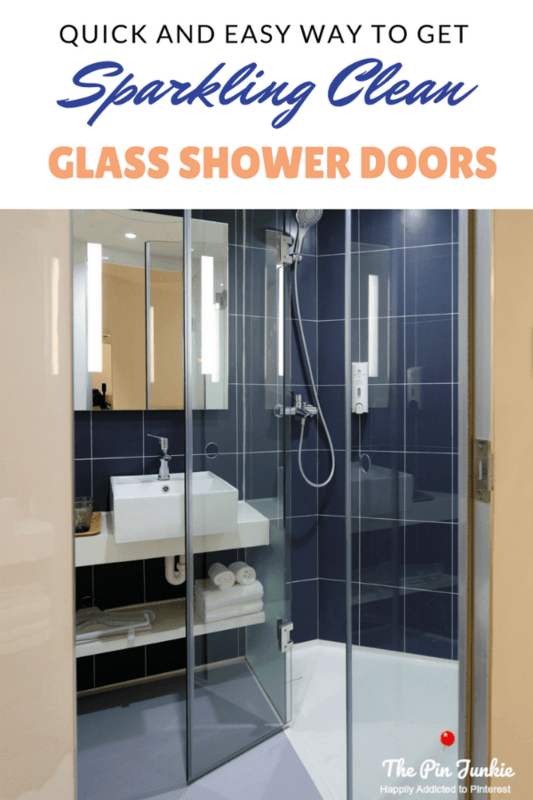 Thanks for sharing and linking up with us at the BeBetsy BRAG ABOUT IT Link and Hop. We'd love it if you would link back to BeBetsy! Grab a Button. Wow this looks yummy! Can't wait to try it. This looks delicious! Perfect for dinner. Thanks. Tacos are my fave! I'm totally making this asap! Thank you for sharing at our Pinteresting Party! That certainly does look like the best taco casserole I've ever seen! :) Thank you so much for linking up with me this week at Tasty Tuesdays! I’ve pinned this & shared it with my followers! Please be sure to stop back by the party and check out some of the other links! Great post! I now need to try this! I'm guessing it would be a hit at my house! =) Thanks for sharing! 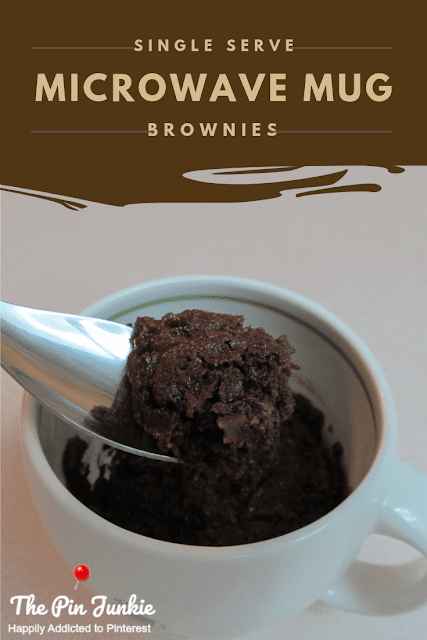 I found you on Domestic Superhero Link Party! Oh yum! Loving this. Thanks for sharing! 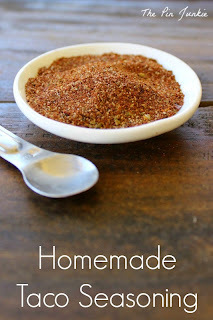 We are having lots of company this summer, so this recipe looks like a good one to try. You are today's Dare to Share Feature of the Day. Thanks so much for linking up! Thanks for the feature Pam! Looks and sounds yummy! Thanks for sharing on Tried and True recipes! I made this tonight and it was very good. Next time I think I will add onion and green chilies. Thanks for sharing! I LOVE green chili! It tastes good on everything! I made this tonight, we really enjoyed it!! I would double or triple it next time, and put it in a 9 X 13 pan to get more servings. Would highly recommend!! We make this all the time. None of us want the cheese melted. So we just layer the plate (or fill the bowl) depending on who is eating now! Yes. That's one of the reasons I like this recipe so much. You can easily change the recipe depending on what you and your family like. looks so good! would soft flour tortillas be good to use instead of chips? I chop a cup of onion and cook with the meat. then follow the recipe. Dang good. am 77 and used this for years. I made this for dinner tonight. It was good but next time I will leave the chips out. The microwave made them taste stale. Other then that it was very good. Don't know why you'd leave out fresh tomatoes (in season) and the black olives. I made this using fresh tomatoes and black olives (which I love) and subbed garbanzo beans for the pintos (which I hate) and it was over the top delicious. Def help thus poor mom out with Taco Tuesdays @ our home! Excited for the change! Sounds like something my family would love. Could this be made with soft shell tortillas? I finally got around to making them last week. 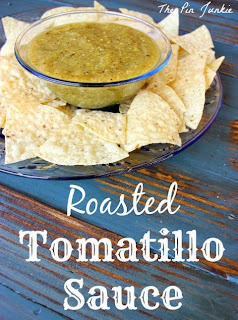 They were so amazing that I am making them again this week.